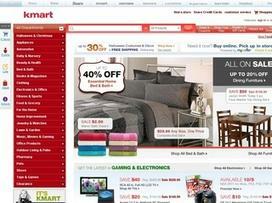 If you're looking for the most popular and reliable brands online, choose Kmart. At this one-stop online store, you'll find thousands of items at some of the most affordable prices you can find anywhere, whether on the web or in the retail market. Kmart operates more than a thousand retail stores in all fifty states, as well as Puerto Rico, Guam, and the U.S. Virgin Islands. In fact, the largest Kmart store in the world is in Guam! Among the brands you can find on Kmart's website are Joe Boxer, Martha Stewart Everyday, Jaclyn Smith, Disney, Craftsman, Abbey Hill, and many more. Kmart is one of the very largest discount retailers in the nation. It enjoys a good reputation for its responsive customer service and outstanding selection of products. Trust Kmart for all your daily needs. You may not know that Kmart's home decor, bedding, and bath products are remarkably stylish for their price tags, which are competitive with other online megastores such as Wal-Mart and Target. The selection of gear and clothing for babies and toddlers at Kmart's website (www.kmart.com) is wide and appealing. Kmart also carries jewelry, electronics, clothing, shoes, fitness and sports equipment, health and beauty products, home appliances, tools, garden supplies, toys and games for children, bicycles, and even food, should you desire to buy it online. Kmart is a great place to purchase furniture, regardless of your budget. The site sells everything from dorm-room futons to high-quality leather sectionals and offers furnishings for every room in the house, including dining sets, mattresses, and entertainment centers. While only the discount furniture is available in stores, Kmart's website allows you to broaden your horizons. Kmart has been in business for over a century; its origin was as a "five and dime" store, where all products were 5 or 10 cents each. Inflation has necessitated price increases, obviously, but the goal of making a wide variety of items available for little money remains one of the company's top priorities. In 2005, Kmart bought Sears and created the Sears Holdings Corporation. Discounts and daily deals appear on the homepage, so check back often. With a click or two, you can get in-depth information about a specific deal that interests you. You can also view your local weekly ad if you prefer to visit the store in person. With so many high-quality products for prices you can afford, you will enjoy every moment of your shopping at Kmart. Act now... Expires Today, April 20th @ 2:59pm PDT! Share what you think about Kmart, and your favorite ways to save there! Need a new BBQ grill for summer. I love to shop at at k-Mart. Very well organized. Not so crouded. man shopping needs deal for grandkids!